It helps to learn from your opponent. 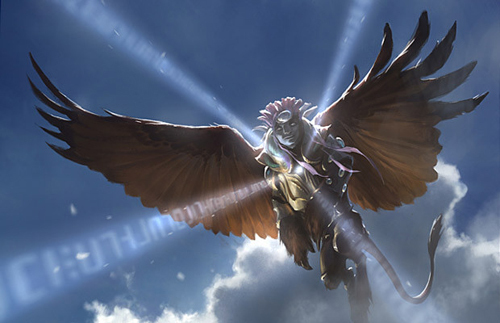 With respect to that, I’m starting a new article series featuring a different guest writer each time who is playing one of the other archetypes in Standard. Hopefully this will help you play those matchups better and also get a breather from my writing style. Enjoy! That minor visual provided above, is reminiscent of how I came to write this article for this site. I play Magic often with the proprietor of this site, and the games are very back and forth, with trash talk, thought and respect transferred often back and forth as the currency of these exchanges. My name is Darrel Feltner, and I am pleasured to join you all in this installment of From on The Other Side of the Table. We are all brought together by this wonderful game we play, and my story of immersion into it is relatively simple. I used to play Yu-Gi-Oh competitively and travel for it, and eventually when I was 13 I got bored of the game, and sought something more challenging and slower paced (the games ended very fast), and I found Magic. I learned one hard knock at a time like all of us has, and I cut my teeth on the most complicated decks. I played U/G Madness at the start, but really cut my teeth on the deck of Dr. Teeth himself. Well, having cut my teeth on a deck that plays that beautiful monster, counterspells, removal, and card draw, I clearly was built as a control player at heart. Trying to play every permutation of the best wrath effects, card draw, and trying to end the game with the cheese standing alone. 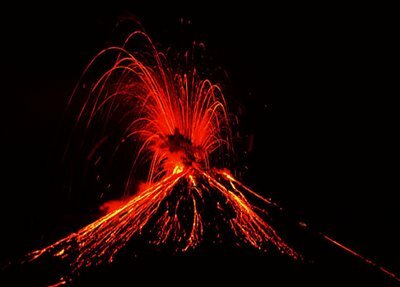 The lone threat, rising above the ashes, avoiding succumbing to becoming part of the Burning Earth, the smoldering ground where many of the opponents to our Mountain wielding friends have laid people to rest. Today, on The Other Side the enemy is: ESPER CONTROL!!!!!! I will address the main differences in my list and the stock lists and then we will get on to the juicy part: The Mono Red Matchup! First off let’s address the Planeswalker counts. Three Jace: This is a very strong card in the deck, but it is also very clunky. If you cast it when you opponent has one 2/2 on board, you are either fogging and trying to draw cards and losing Jace, or +1ing Jace and hope you opponent doesn’t Hero’s Downfall/Dreadbore/Detention Sphere it and if they don’t you are very far ahead. If there are more creatures on the board then you are just forcing a 3-5 damage exchange, and if they ship everything at Jace it is the best card in your deck, but if they ignore it, then you know you spent a turn doing nothing and are in for a world of hurt. No Ashiok: I have discovered that this card is pretty underwhelming. It comes into play and you mill them, and they then send a guy or 2 at it, and burn it or just attack it down, and it is terrible. It is a card I could see being a 1 of, but not a 3-4 of. We don’t actually want to play this on turn 3. This card is best played into an empty board, then using it to mill your opponent and steal their threat to kill them. This is possible if your opponent has an empty board, but if they one to three 2/2s on board, it is pretty terrible. So to try and be a little better against Aggro game 1, I chose none of these. 1 Elspeth: This was a concession to the fact that AEtherling closes games so much faster, Hero’s Downfall is a card, and Control can’t beat a resolved AEtherling unless their opponent goes brain dead. No Temples: I am a huge fan of tempo being a Legacy player, where all the lands come into play untapped, do everything, and every single shot at every mana matters. Having the ability to cast a two mana spell on turn two without taking damage is so important, especially with Aggro decks in the format. Because of this, hands with a couple Temples and a couple Shocks easily have you starting the game at 18-16, and then they get a few hits in with Cackler/Zealot/BTE, and all of a sudden you are saying the following phrase: “Hallowed Fountain, untapped, go to 4, Supreme Verdict” and resting on your laurels, praying that there isn’t a planeswalker or haste creature coming towards your face in a rapid fashion. Plus it gives the Esper deck the ability to fight the R/x decks (Ramp or Aggro) that use Burning Earth as a sideboard card. Manabarbs is unbearable for Control, and they reprinted it in a “fair” way, that if you don’t fill your deck with rare lands/guildgates (if you have to) then you can evade it. We are obviously rewarded by being U/W here, but I would rather have access to black removal and Thoughtseize for other matchups. That is all of the stylistic portions of the show, now to get to the nitty gritty analysis for the matchup. The Red Matchup for Esper is typically in the Red player’s advantage if they know how to not overextend. The plan is pretty obvious for game 1 though; we want to kill all of the creatures using our spot removals, and then cast Supreme Verdict on turn 4. Then play a Jace, Architect of Thought into an empty board. Hit your land drops as often as possible, and fire off a Sphinx’s Revelation for X=3-5 Range. Once we have done that, we are typically at what I would call a comfortable life total (10-12) and then take control of the game by slamming the door shut with an Aetherling/Walker, or Revelation for x=6+, which typically prompts a concession. So, GG, you guys won Game 1, but I am ready to go to the boards, because I feel like that shores up the matchup. Out of the boards for me: We for sure bring in the Doom Blades because killing creatures is important, we bring in Far//Away, because it can buy so much tempo. Finally we are bringing in Pithing Needle. Mutavault is very backbreaking and we can’t have it do anything other than be a colorless land, and being able to make Hammer do less and Chandra do nothing. Out goes the Psychic Strikes (three mana counters are too slow), the Elspeth, the Merciless Eviction, and one Azorius Charm (killing better than putting on top). This is the plan most of the time and doesn’t really deviate on the play/draw. Needle is the only debatable card, but if you see Mutavaults or Hammers then you bring them in for sure. The red player’s play style doesn’t actually do anything to change the cards in the deck, it just changes how and when I use my removal spells. 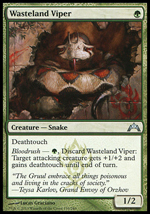 If our opponent is more aggressive, we want to save our spot removal for post wrath to pick off their threats. If our opponent is more conservative, then we will spend our 1-1 removal spells to take the pressure off of us, and when they feel the pressure mount on them, and play multiple creatures, we go for the throat with Verdict. 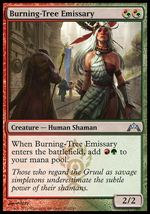 The best cards that you as the Red player can have are dependent on lists. Most Esper Control decks (PT decks etc.) are playing 1/3 of their lands as basics. 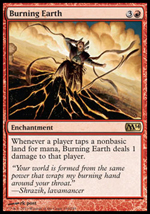 As a result, Burning Earth is typically a very powerful sideboard card against the Esper decks, and will cut them off of black mana to keep them off of their Doom Blade variants. Against my build of Control, it hurts less, but not enough to be ignored. Skullcrack is also a very powerful card against this deck, because the way I try to shut the door on you is to gain seven; draw seven. But if they can create a ten point swing by negating that life gain and then deal three damage, they have crippled the stabilization process, which is very valuable to closing the door on us in reverse. Mutavault, Hammer, and Chandra, Pyromaster are three cards that give the Control decks fits, because they are hard to kill, create repetitive threats, and draw cards respectfully. When you are trying to keep the board at parity and then pull ahead with cards in hand, this is crippling when they keep filling the board. The deck moving forward has some changes that I could potentially make, but I like sticking with a list until a card shows that it’s not useful. The only card that has proven to move on its way out is Azorius Charm. The ability to do something in both Aggro matchups and Control matchups is wonderful, but I just feel like the card is inefficient for what it is trying to do. I think that the deck needs a card that is just a powerful effect, and not try and flirt with flexibility. The Jace, Memory Adepts are on the chopping block, because it is never a card I am excited to try and kill my opponent with, and may become a Psychic Strike and something else. The Doom Blades are always in flux with Last Breaths and Ultimate Prices, trying to find the correct collection of removal spells to close on the biggest threats in the Meta, which is a flavor of the week assessment. I would also like to try a second Elspeth in the Main, but Elspeth is very slow and closes the game poorly in some matchups, yet is infinitely better in others. It is a very polarizing card, and I am willing to give it a shot either way. The deck itself is ever evolving however, because of the fact that it is a Control deck you have to make your choice of what you think is the most popular selection of decks and prepare for them, and be willing to be caught with your pants down in a matchup or two. I think that the Aggro meta with Master of Waves at the helm makes this deck a reasonable choice as long as you figure out how you want to beat Thassa, and may cause the deck to play Gainsay because of it. I believe that soon the B/W Midrange and G/R Monsters decks will now come into prominence. Since Control won this weekend, and with Master of Waves on top, Doom Blade is a powerful card which means there will be Doom Blade and Control decks. I think that Mono-Red is going to have a tough run here in the next couple of weeks with the pro red army in a can and the all Doom Blades and 6/6s decks on top. 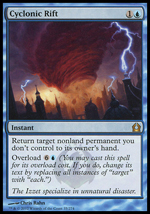 Once Control jumps on top again, then Esper will come out to play geared for U/W/x Mirrors, and then the Red mages can light the earth on fire again and cast their four mana enchantments to make people with bad mana bases sad. Now you shall never falter in one hundred battles, you know your enemy, and I assume you as the Red player know yourself, and you should feel better equipped to see your way into the mind of the controller, and take back control yourself. WE know this game is a game of competition, but I would love to leave you with a story where fun was had, and the game was more than a grind. I was playing a game of EDH recently that may or may not have gotten a little out of hand. I was playing my Zedruu the Greathearted EDH Deck, and we were having quite the game. I littered the board with enchantments that made combat a nightmare for anyone who wanted to do it, and then I casted Akroan Horse. 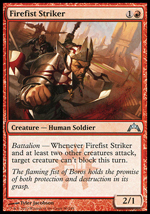 Everyone’s favorite draft Rare from Theros, gave it away, and everyone got a soldier! Then things got a little bit confusing. I casted Confusion in the Ranks (go ahead and gatherer that one kids) and passed the turn to the player with the Akroan horse. Tokens came into play, triggers went onto the stack, people got confused and people got sad. The confusion in the ranks that was created at our table was glorious, and the next turn, I drew eight cards from my Commander. So much value, and so much entertainment trying to watch three other people resolve all of the triggers that resulted from every spell they casted! I embraced the insanity, and we had a ball playing the game, a game I am sure no one who participated will ever forget! Enjoy yourselves everyone, and I hope that being on The Other Side of the Table was educational, and I would be more than willing to take you under my wings and bring you over to this side permanently! Hope the read was wonderful! Feel free to leave any criticism so that my writing can get better! I had half an article written up prior to SCG Milwaukee last weekend, and I was going to finish it last Saturday. Then I couldn’t figure out what I wanted to say or what was the right direction for Mono Red at the moment, so I clicked Delete. Most of the time when writing I get into a flow and the direction is fairly easy to continue along from there but it was being especially difficult last week because I couldn’t figure out what Red cards I wanted to play. It was the first time I’ve ever deleted an article, and this one was aptly titled “Information Overload”. It started when I had a conversation with four local players who all also play Mono Red. All five of us had very different lists, yet all of us were either having success or had a grasp of the plan we had in mind when executing the deck. Obviously, that’s pretty good for Mono Red, but it was really hard to say which person’s direction was better. Myself and another friend Zach were both fairly close to Bertorelli’s list from SCG Worcester, with most of the changes coming in the sideboard. He played 74 of my 75 when we ultimately went to SCG Milwaukee, and the biggest changes we made over Bertorelli’s list were to add additional “can’t block” cards in the board to help the GW and Midrange matchups. 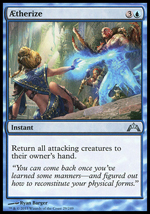 We also added a few Shocks to deal with the Master of Waves Blue Devotion deck that had sprung up that Thursday at the Pro Tour. 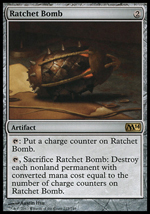 In Hindsight, we both wish we had Ratchet Bombs in the board (which I did consider but ultimately didn’t feel I had the sideboard room). The matchup is tough, although quite winnable, and Bombs really help swing the pendulum in the proper direction. Electrickery is not bad either, depending on how hard you want to slant against the deck. My other friend Mike had been having a lot of success with a very streamlined list that was reminiscent of pre-rotation Theros. He was running a Young Pyromancer build with twelve two-drops, just Chandra’s Phoenix at three, and some Chandras and Stormbreath Dragons to top it off. He also had another two Stormbreath Dragons out of the board. I was extremely tempted to audible to his deck for the SCG because he had won boxes the last two Tuesdays at our local shop and had won a few FNMs, so the deck clearly had some legs. My only issue with his build was that he was not running Fanatic of Mogis which I feel is a fantastic card against decks like GW and GR, both of whom have very little interaction with you and get severely crushed by 8-10 damage Fanatics. In fact, in a lot of games, Fanatic is truly your only way to victory, as everybody knows that Mono Red can get stalled out if your opponent develops his board well enough. Mike’s thought though was that he really didn’t like how removal and sweeper effects could limit the Fanatic’s potential, and that point is certainly valid. And to be honest, that’s exactly what I thought about Fanatic after getting over the initial excitement of seeing the card in the spoiler. In my early Theros testing days, he was hit or miss depending on the situation. But a big change from the decks I was testing then was how heavy the amount of devotion in my deck was, so I quickly turned the corner on him as a card after playing Bertorelli’s list. I think if Mono Blue Devotion and GW stay in this Metagame as major players, you’ll absolutely want to have Fanatic onboard your 75. Prior to the tournament, a friend of mine posted on Facebook to our local MTG group that I had a striking resemblance to a certain Red Theros card. I took a second glance, and eh, not bad. Did a little five minutes of Photoshop and you have the above. 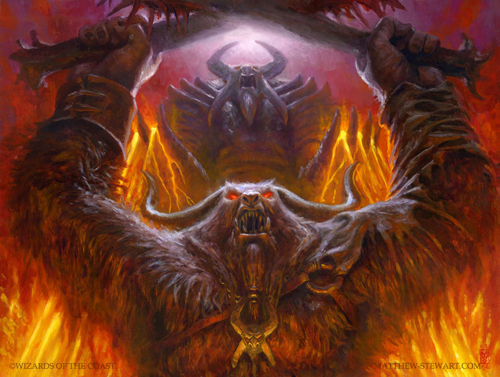 People on the group thought it was pretty fitting given my obsession with Red and even dubbed that from now on Firedrinker Satyr should just be called John, much like Dark Confidant is called Bob after Pro Tour Player Bob Maher (also from Madison). Maybe when I make the Pro Tour. . . Overall, SCG Milwaukee was a lot of fun and I did OK, but nothing spectacular. I began the tournament with a 4-0 record, beating RUG Midrange, GW, GW, and BWR Midrange. At that point I was pretty happy, as none of those are particularly stellar matchups yet I had played carefully and worked around multiple Anger of the Gods and Polukranos. I had one unfortunately testy situation come up in Round 3 against my GW opponent, Brian, who I knew from a nearby town. I had taken the first game very quickly, and in the second game had gotten him down to three life. It was at this point he swung in with a large army including a Polukranos with five mana to go Monstrous. I had an unleashed Cackler and a Phoenix on my side of the board. He tapped the mana for the Monstrous ability following combat, and verbally declared “two and two”, followed by individually pointing at both of my creatures. I told him that “X” had to be double, and that he had declared targets already. Ultimately a judge was called, an appeal went through, and the head judge rolled us back, allowing him to untap lands and re-trigger the Monstrous to his choosing. I’m not sure what’s the correct ruling there, although some other judges I know verified it and I should know these things since I’m partially training to become a judge. Fortunately it didn’t matter, I forgot what was in my hand and that he’d only be able to kill one of my two creatures anyway, so that, combined with an Ash Zealot took down the match. In round 5 I was seated at table 2 and was paired against Mono Blue Devotion with Master of Waves. I was aware of the deck, and knew that the way to beat him was to play very aggressively and kill as many early guys of his as I could to cut off his devotion so that his Master of Waves would not be out of control if he got it down. In game 1, that scenario played out and I killed him quickly. In game 2, I mulligan’d to five cards on a one lander and got shut down quite easily by double Master of Waves. Game 3 was frustrating, as I had to mulligan again, this time to six cards with only one land. I thought about going down to five, but I was on the play and I had double Burning-Tree in hand with some burn and Rakdos Cackler. Unfortunately I didn’t hit my second land until four or five turns into the game and by that time I couldn’t crawl my way out of the hole, nor out of the double Master of Waves and Thassa draw my opponent had. I probably should have mulligan’d this, but the fear had set in as it usually does when I’m X-0 and the deck starts taking a poop. NOTE TO SELF: ALWAYS HAVE HATE FOR THE NEW PRO TOUR DECK. This was just an oversight on my part. The Mono Blue deck was all over the room. While it only finished in the top 16, many good players there were piloting it and they all had late round losses to keep them from getting farther. This ended up being the only match I played against it in the ten rounds of the tournament, but once is enough. The next round (six), I lost in two games to the ultimate winner of the tournament, Zach Stern, playing GR Monsters. I mulled to four, followed by a mull to five. Yep, it was time for my deck to use the bathroom. Don’t get me wrong, I’m a little jaded from that series of events, but I’m not going to solely blame my losses on mulligans. I did get to play “some” spells during those games, and my opponents did play fairly good openers to make sure the door was sealed shut, but boy does it sting to lose in this manner when you’ve put in so much time and testing. The good news is that there is always another tournament right around the corner and another chance to prove how good your 75 is. I kind of went on tilt from there and ultimately finished 6-4. Both my friend Ryan and I could have made top 32/64 and cashed if we had won our last round, but sadly we both got beaten blindly. GW finally stuck in the dagger as my opponent mulled to five and then proceeded to play three Voice of Resurgence. Match Slip Please. 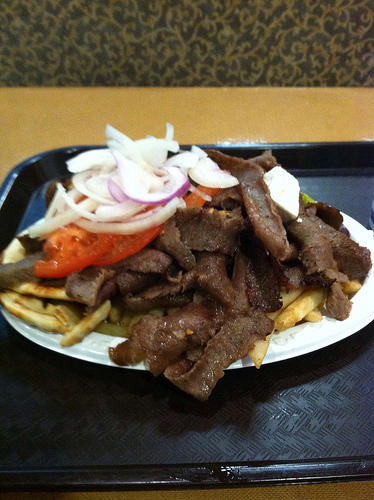 For those of you who haven’t been to Milwaukee, WI before, Oakland Gyros is where it’s at. I went to the college in that city, and this place was a longtime late-night staple of mine. They do it all right, friendly and prompt service, quick food, delicious entrees, the best cucumber sauce on this Earth, and nice cozy booths so you can pass out after inhaling your gut bomb of a Gyro. After literally 13 hours of slogging through competitive tournament Magic, this meal was a godsend. It also helped give us just enough fuel to stay awake on the ride home, as the five of us in my buddy’s car were so slap pappy that we were offending gas station clerks, throwing out phrases like “Spankin Fools”, and actually thinking our Standard decks were good. Just kidding, but at least one of us cashed and we all were happy to have been above .500. Mono Red: Where Do We Go? I like Jeremy’s deck. It’s very similar to Bertorelli’s, although he’s added a few Mutavualts (free mana anyways, basically) and included a maindeck Hammer of Purphoros and extra Shocks instead of Magma Jet. For starters, Hammer seems way better than the singleton Gore-House Chainwalker which has been pretty much universally panned by everyone since Bertorelli won. I sided in my Hammers in several matchups at the SCG, including the mirror, and was incredibly happy with the card. The inevitability of just turning lands into guys with haste is too good to pass up. 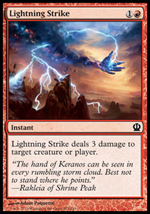 I really think going forward that Hammer is going to be a staple card in Mono Red, so I’d suggest picking them up now while they’re still absolutely way too cheap for their own good. I’m not quite sure why Jeremy decided to go with another Mutavault in the board. I’d say with 23 lands you should have no trouble casting Burning Earth out of the board, and while it gives you a little more insurance to have the 24th land and it gives you some added game against Supreme Verdict, it just seems unnecessary here. It easily could have been a third Ratchet Bomb, Mizzium Mortars, Chandra, Skullcrack, etc, etc. Otherwise, his list is really competitive on paper and I wouldn’t have a problem suggesting it going forward. Verrrrrrry Interesting, very interesting. This deck is doing a lot of things. For starters, it has no Fanatic of Mogis, so we’re clearly going for a more aggressive stance, yet it doesn’t play quite the suicidal package that Owen used at SCG Worcester. Instead, we have the full playset of Chainwalkers and both quality Mono Red three drops are present. I love that he has a full twelve burn spells maindeck, Magma Jet has been one of the best cards for me and I was a little sad to see that Jeremy Stowe decided to dismiss it. Granted, he got 2nd place at a bigger tournament, but Jet is just insane! It’s a shame that it’s two mana and all, but scrying twice is too invaluable. I digress. . . The sideboard is where he really spiced it up. Mindsparker hasn’t seen any play thus far, but he’s using the full playset. I kind of dismissed the card given the quality level of all the three drops we already have access too, but if you think about it Mindsparker is fairly reasonable against BOTH Control and the Mirror, especially if the Control decks and Mirror matches stay the way they are. The Control decks all use heavy white removal spells (Azorius Charm, Detention Sphere, Supreme Verdict) and the Mono Red mirrors usually boil down to Boros Reckoner. While Mindsparker is no Reckoner, you might as well have another big First Striker alongside of him. It’s a shame he dies to every burn spell in the deck, but it’s still not a terrible card for a test run and it clearly served Robert well on his way to Top 8. Toil and Trouble is a carryover from RTR Block, and I love seeing it here. This alongside of the playset of Skullcracks will absolutely PUNISH both Control and Midrange players who just want to sit back on their ladels playing removal spells and holding end-gamers in their hands. I’ve been trying to figure out a list where I could play the combination of these two cards, and Richard puts it together beautifully here. While I think the maindeck needs to choose whether it’s aggressive or late-game, the sideboard seems purely money to me. It will need a slight adjustment for the Mono Blue Devotion deck, but otherwise you have a lot more reach than other Mono Red builds. No Firefist Striker. Hmm. . . I don’t know if that’s where I want to be with giant Green monsters running around everywhere, and cards like Blood Baron of Viskopa, but I’ll admit that he’s not a stellar topdeck and he requires a lot of work to get going. Still, he’s won me a lot of games so it’s hard to not play him right now. That said, AlfredoTorres is an extremely talented player who has done well with Mono Red in the past (I believe his real name is Anthony Davis and I think he writes for TCG Player), so it’s possible that the change isn’t that big a deal. He basically subbed them out for Firedrinkers, which I too ran at SCG Milwaukee. I ran the Firedrinkers at the cost of Shock, but that card can be really good in a deck like this and sometimes function in a similar role to Firefist, so it’s all going to boil down to Metagame and personal preference. Peak Eruption and Electrickery are his big changes in the board, which I imagine are there pretty much for the bigger red decks like Big Boros, GR Monsters, Mono Red Devotion (Nykthos), and BR/x Midrange. Electrickery for Master of Waves tokens. 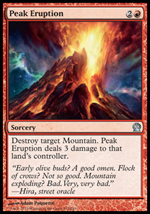 I haven’t done a lot of testing with Peak Eruption, but the little I did proved it can be fairly effective against the right opponent. I think if anything, I’d really want it for the BR/x decks, as they seem to be able to put the most punishment on Mono Red. Trading Post is a tough card to deal with, along with Anger of the Gods and Desecration Demon, so having something that disrupts their ability to get there is pretty huge. Torres’s list spawned some more success just following his Premiere win, the next day’s Premiere had pilots playing almost identical 75s in both the fifth and sixth place positions. This lends even a little more credence to the idea that you don’t necessarily need Firefist Striker to win, although it could also be due to a different Metagame online than in person. As usual, I’ve been making changes on a daily basis. Yesterday I went 3-1 at my win-a-box tournament, playing a heavy Red devotion list with only three maindeck burn spells (Mizzium Mortars). I had Purphoros, Hammer, Chandra, and Fanatic maindeck, and just wanted to see how crazy I could get with it against these decks that don’t like to interact. I beat Mihara’s GR ramp deck from the pro tour, and a few other aggro matches that I sadly can’t remember well. I lost to Mono Blue Master of Waves, AGAIN. I even had two Ratchet Bombs and more burn in my sideboard, but it just goes to show that you really need to pay heed to that deck. Most of you are probably thinking that I’m smoking on some funny stuff and that the matchup is horrible, but I insist it really isn’t. I think the answer is just that you absolutely need to be running a minimum of three Ratchet Bombs, preferably four, and possibly 1-2 Electrickery. Yes, those cards aren’t hot in other matchups, but it’s worth it if this Mono Blue deck stays for a while. Four Mizzium Mortars in the Sideboard. This is a must, I have really missed this card since I cut it down. I know Bertorelli advocated taking some out, but this isn’t what I want to be doing at the moment. Mirror matches are going to sideboard in Frostburn Weird and possibly Stormbreath Dragon, and the card is an all star in the GW, Naya, and GR matches. It’s a key piece to victory that I don’t think you should sleep on. Hammer. I really love this card. At least play 1. Control is an easy matchup, don’t dedicate too many cards to it in the Sideboard. 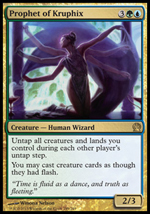 It seems like UW has faded and Esper is the default, which actually is great for you. For one, Esper tends to be slower because of the mana, and they are heavily punished by Burning Earth. While I’ve hemmed and hawed over playing the card, it’s won me six or seven games in the last three tournaments alone. It doubles at being good against BWR which is not nearly as friendly a matchup. So have some Burning Earths, a few Hammers, and if you want Skullcrack/Toil and Trouble, but call it a day after that to save room for the stuff you really need cards against. I think the last few sideboard slots should be dedicated to midrange and bigger Red decks. That means, Peak Eruption might make it in my 75 for the first time, obviously Mortars will stay, and I think my Madcap Skills/Goblin Shortcutter days might be a thing of the past despite having won me some games. They’re really only good in the GW match, and I feel that you want to avoid being narrow at the moment with so many different players running around. Notes: You may want more cheap burn against other Aggro, you may want 1 or 2 more cards against Control, and you may be able to shave a singleton from most of the above to fit in an extra card or two if you’re not wildly fond of the ones above. This is just a start to show you where my brainstorming is at the moment. I’m also still considering Richard Gathings sideboard a lot, as it looked super duper scary. Some of you have asked about Big Red, and I think it’s worth taking a quick look at two lists which I think are absolutely bonkers. While I probably wouldn’t play them due to the fact that they don’t have as fast a clock as Mono Red Aggro, they certainly seem powerful and both finished strong last weekend. They’re also really expensive, so that’s been a barrier for me (shouldn’t be for competitive magic players, but alas sometimes we all get hit by it), but don’t let that stop you from taking them for a spin. It’s possible this is just where you want to be with Red. This list reeks of greatness. Cornelissen hadn’t even drafted Theros prior to this Pro Tour, and I don’t know how much playtesting he got in with this deck, but he certainly did good enough to justify running it. It looks like it has cracked the code for Mono Red Devotion, and while it needs a bit more hate for the Mono Blue Devotion deck, its got the rest of the pieces to being successful in this format. My biggest gripes are the full playset of Nykthos, although he’s clearly going for the nutdraw with it. 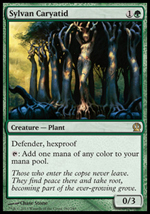 That said, you don’t have ramp creatures like you do in green, so even though you might get a multiple Burning-Tree draw and be able to create a large Nykthos pool on turn three, it’s just not quite the same. If any of you readers have time to test this, I’d for sure add it to your suite as this looks like it could be the answer to this format. This last Sunday I attended the Wisconsin State Provincial Championship and was fortunately able to break through into the top 8 with Mono Red Aggro. I did a lot of testing in the week leading up to it, and I want to cover some of my thoughts on the deck as well as hopefully helpful guidance to others on the recent success I’ve been seeing. Going into the tournament I expected to see a slight rise in Midrange archetypes, specifically GW, and BR/x Midrange. 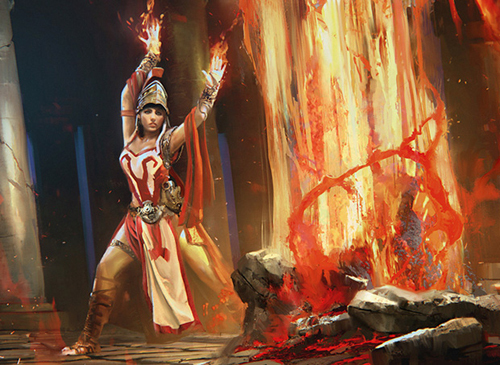 Since Control and Mono Red had been the big decks of the first Theros Standard weekend, it was natural that archetypes which have some flexibility against both would try and strike a comeback. 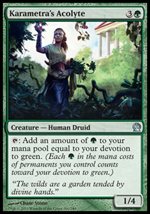 As many authors over the course of the week had pointed out, Voice of Resurgence is a good card against just about everything, as is Loxodon Smiter, Obzedat, etc, etc. On Saturday I was playtesting and watching some of the SCG stream and saw both GW and Mono Green making big moves, so I knew that some of this would carry over to the local States meta, although people still love their favorite standbys so I wasn’t going to dismiss Control and Mono Red. It also usually takes some time for the local meta to adjust, so I imagined it would only be a slight uptick in the Midrange numbers. I had been testing the most with Philip Bertorelli’s winning list from the SCG. The few areas where I wanted to see change were the 1-of Gore-House Chainwalker and the Sideboard. Gore-House just seemed out of place, and he really wasn’t a great late game topdeck. Most of my testing involved slotting in a Mutavault for him, because I was also worried about running 21 lands. After plowing along through a number of games, I kept finding that Mutavault was actually underwhelming in this particular build, mostly because there’s so much that requires double red mana and also because you want to try and cast two threats a turn whenever you have the opportunity. This testing process went on for a long time, and then the night before the tournament I remembered Goblin Shortcutter from Owen’s list and realized that it accomplished most of what I wanted in that slot. 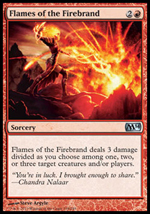 While it’s not a great creature, it essentially is the fifth Firefist Striker, and with an uptick in Midrange that’s the ability I want to see the majority of the time. I really don’t need the three power, I just need to clear a path and burn doesn’t always do that with some of the bigger creatures in this format. The land also seemed to be working mostly fine with 21 lands, even post board, so I resolved that not having a 22nd wasn’t going to kill me even though it would mean smoother curve outs. In the sideboard, I wasn’t a big fan of Frostburn Weird as I outlined in my last article, although I may have changed my tune after this tournament. The mirror match as it turns out is pretty stupid, and the areas where I thought I could gain incremental advantage like was the case with previous Red mirrors don’t play out quite the same because of the extreme level of damage that Fanatic of Mogis deals. I cut the Weirds and basically ran the Firedrinker Satyr’s in their slot to give me a faster clock against control and also be able to pump into blockers (like Sylvan Carytid). He worked out exceptionally well, and was easily a big win-con for me in testing and in the tournament. He was so good, infact, that I think I’d be willing to put him in the maindeck at the cost of some marginal percentage against the mirror. There are so many slow decks in this format right now that are really punished when you get the aggressive draw. I’m not advocating to go as suicidal as Owen’s build, but having 7-8 one drops is probably better than 4 at the moment (at least until people adjust). Against the Midrange decks, I wanted two different options. Madcap Skills was the great late breakthrough in the 9th hour, after I scoured some of the interwebs and remembered how good this card was last Standard season. While it’s not something I’d bring in against the BR/x Midrange decks, it’s pretty much exactly what you want against GW, and it’s reasonable against Naya if you play carefully. In this format, everyone’s answer thus far to Mono Red is “Well let’s put down a wall or a 1/3 in front of them and we’ll be fine until we get our late game online.” With that in mind, there’s one solution; get around that guy. Madcap presents such a large amount of damage that even if you get boned by a sweeper on turns 3/4/or 5, you still got your value worth from it. And in the games where they stumble even the slightest against this card, the game is over immediately. I was very happy with the choice and will continue to advocate it going forward. Mugging was the other card brought in late towards Midrange, and this was mostly a concession to cards like Desecration Demon, Blood Baron, Ember Swallower, and any other cards that Red had limited removal against. Sure, Baron can be killed with Mortars, but many of these others cannot, and sacrificing creatures every turn to Demon adds up. Usually if Mugging just buys you that one turn against Midrange to swing freely so you can put them in lethal range and that’s all I was looking for. It also doubles as a card to bring in against the mirror and other aggro decks, as I wanted to have some supplementary one-mana burn spells post-board against those archetypes. The one very large drawback is that it doesn’t have the ability to go to the face, and that’s fairly relevant, so I’m not sure if I’d run two in the future but I don’t have a problem with it as a 1-of. There’s also the otherside of the spectrum, which is maxing out at 4-of and just guaranteeing that the card comes up at the right time. 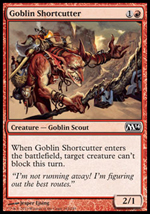 Goblin Shortcutter might be better, he’s another possibility for this slot. Philip Bertorelli mentioned in his article last week that he wanted to cut Mizzium Mortars, but I still think it’s critical to some matchups. While you have Firefist Striker and the changes I made above, you still just want to KILL a Loxodon Smiter a lot of the time. Blood Baron is also straight-nasty, and not having any kind of answer other than combinations of spells is really not where I wanted to be. I’d still like to run four of them, but sadly there just isn’t room in my opinion. Every sideboard card I ran on Sunday was desirable, and there were more that I wanted to fit but just didn’t see cuts for them. Skullcrack was a last minute switch with the fourth Madcap Skills, as the card is great as a Miser against UW and Esper and at keeping people honest. If they know you have it, they will certainly fear it and tread more cautiously which gives me time to do other things or bluff them for a few turns. I’m inclined to run more of them, because it’s really good against these matchups, but it provides no permanency. Hammer of Purphoros, Chandra, Pyromaster, and Pithing Needle all go a long way in helping you keep pace in a game that stretches on longer than you would have hoped. Chandra can have impacts in the mirror match as well, if they are running a build similar to Owen’s you can pick off a lot of guys and just out draw them with it. Having a combination of Hammer and Chandra means that you won’t just be subbing in more expensive cards for what you take out, and Hammer will provide haste to your Fanatic of Mogis’s which turns him into a virtual Hellrider. This match was very close, from what I remember I basically just raced until he verdict’d in both games and then followed it up each time with Chandra’s Phoenix and burn to close the deal. I sided in x4 Firedrinker, x2 Chandra, x1 Hammer, x1 Skullcrack, and took out x4 Boros Reckoner, x2 Shock, and x2 Lightning Strike. I’m not wild about taking out Lightning Strike, but Skullcrack makes up for it and the rest of the stuff you’re bringing in is super solid. Feel free to shave the Goblin Shortcutter or some other “dude” instead if you prefer. His version of UW was a little different because he had some devotion element to it with Master of Waves and Thassa (which did me in in the second game), but the strategy was largely the same. I think I actually kept in the playset of Strikes in game 3 after seeing the differences that he had. While Boros Reckoner is a great card in every matchup and a key component to a quality Fanatic draw, he’s just slowing down your curve in this match. You’re much better off streamlining the deck and going for the reach angle. Supreme Verdict can already screw up your Fanatics, and even if he does land on time with guys on the board, the rest of your critters and Chandra’s Phoenix still make him potent enough to be a real threat. Fanatic won me a significant number of games on the day so I can’t stress enough how good he is in this build. 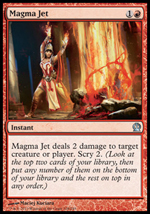 One thing that is your best friend here, and in just about every other matchup, is Magma Jet. Everytime I get the random thought that I want to cut the card or reduce its number, it reminds me of just how much better it has made red by being reprinted. It might as well be draw 2, because the scry factor pulled me out of land screw on so many occasions, or organized my draws into making sure my opponent was dead. There were several games where I was able to put a lethal Lightning Strike on top or pitch away two lands to prevent me from flooding out and losing. 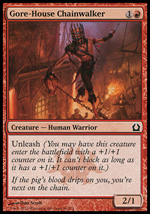 I really love this card in red, and no matter what build you’re playing I think it might be a crime to not be running it. Game 1 I had the play here and out-tempo’d him with guys and burn, including two Boros Reckoners. Game 2 he got way ahead of me with two Reckoners of his own and a Fanatic of Mogis. Game 3 I had three Reckoners. What can I say, the mirror match is super dumb. My initial plan was to bring in Mugging, Mortars, and Chandra, replacing Firefist Strikers since you’ll rarely get to activate battalion with all the burn spells flying around and he then becomes just a 2/1 do-nothing. The cut plan was solid, but what I was bringing in really didn’t do much since all the guys in this build are either resilient or don’t care about being removed once they are on the table. Cackler is another cuttable option, but I wanted him in for the off chance that I get a speedy draw and to eat removal if the opponent falls for it. 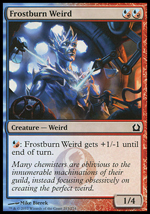 In the future, I think Frostburn Weird is the right call. He’s basically another Boros Reckoner. Your opponent could “next level” you like I did on Tuesday and Sunday by bringing in Mortars, but they have to draw it in that instance and your removal only goes so far in the Mirror. You certainly DO want more removal, but it doesn’t guarantee you a victory. Another potential card is Hammer of Purphoros, like my Tuesday mirror match opponent brought in. It gives you infinite gas and haste, but it’s a scary card to play in this matchup because your opponent can really take advantage of it if he draws the right combination of burn spells and creatures. You also really don’t want another three drop if you can avoid it since you already run eight of them. This is a straight up horrible matchup for Mono Red. I have been working on an MBC list since Theros first started spoiling and it was easily the best deck in my testing phase. I almost switched over to playing it exclusively, but I didn’t feel like shelling out for Thoughtseizes and I hadn’t figured out the Control match to 100% of my satisfaction. My opponent’s list was very similar to the one I had been testing, except instead of Nightveil Specter he was running Nighthowler, which if you haven’t seen in action you better check him out quickly (note, it says “ALL” graveyards). He was running a full playset of Whips, which in my opinion is way overkill but I do understand that he wanted to make sure he drew it. There were a few other choices too, and a little bit different of a removal package, but otherwise the deck was almost a clone. I knew my one chance was to just go as hard and fast as possible and maybe try to bring in the Muggings post-board to get around his Demon. We went to three games, and in the last game he played a turn 4 whip after a removal spell or two and then followed it with a Gray Merchant. He may also have had a Desecration Demon but I can’t remember. I was pretty toast at this point, things were not looking in any way winnable except that I had a Chandra’s Phoenix in play alongside some chumpers and another Phoenix in hand. And then, I got one of those miracles that you need to get in your quest for top 8; he misplayed. He cast another Demon, passed the turn, I tapped it down with a sacrifice and swung for lethal with both Phoenixes. He revealed another Gray Merchant in his hand and said he thought he had time to gain the life later but realized as soon as he made the play how unrealistic it was. I felt bad, but you gotta have some luck go your way to slog through these things so I wished him some luck of his own and went on to the next match. Will is a nice player from Rockford who actually just top 8’d the last Pro Tour Qualifier that I was in where I also top 8’d. We knew we were in for a good match and it didn’t fail to disappoint. Him and I went to three games, all of which were very close including the last game where I had lethal in hand with a second Fanatic of Mogis when he cast his second Anger of the Gods off the top to finish me up. The sideboard plan here was to bring in Firedrinkers (yes they can get burned but you need the speed) for the Reckoners again (yes they are good against his creature suite but just too slow. This is debatable though and worthy of further testing), and Madcap Skills and Muggings for some of your burn spells. You can shave singletons here and there for what you bring in, I didn’t have a hard and fast sideboard approach to this match. The basic gist is you want cards that clear the blockers. They usually only run Mortars + 1-2 other burn spells for their removal, and occasionally bring in Anger of the Gods like he did. You really have to play it based on what you see, and Madcap may or may not be right but like I mentioned before you can sometimes nut draw them with it which is a lot of upside to consider. You can also just bait out Anger and then drop a Burning-Tree into Madcap to accomplish the same task. Ultimately, even though I didn’t get there I was satisfied with the games and was basically a Lightning Strike away from it turning the other direction. 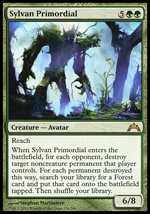 Trostani was also a difference maker in both of the sideboarded games, this was a really strong card choice on his part. Game 1 I kept an incredibly terrible keep. I don’t know what I was thinking, me and a few of the other guys were socializing and talking about the upcoming top 8 and I took a brief glance at my hand with Rakdos Cackler, some two drops, two Fanatics, and a land and I just figured I’d draw into some lands. I had the play, so keeping was even dumber since I already had that advantage. But, sometimes you have a brain fart and you deal with it. I drew 4 straight non-land cards and scooped em up. Games 2 and 3 I brought in the same package that I did against UW. Game 2 I saw that he wasn’t going to be able to Supreme Verdict on time and hit the gas pedal as hard as the deck would allow. Game 3, despite being on the draw, gave me the multiple Burning-Tree into Firefist hand and I was able to get ten power on the board quickly to overrun him. He cast a last desperation Sphinx’s Revelation to which I responded with my singleton Skullcrack. Not gonna lie, it felt pretty good to put the nail in that coffin. Keenan was the top seed in the tournament and I was the third seed, so we drew to get into Top 8. Sadly there was no cake like there was in previous Wisconsin State Championships, so I went next door and got a DQ Blizzard. Gotta celebrate somehow. Needless to say I lost 0-2, although I did put up a fight. In game 1 I got off to an aggressive start only to have him play turn 4 Primeval Bounty into Turn 5 overloaded Cyclonic Rift. In game 2 I opened with Burning-Tree into Firefist Striker into double Madcap Skills and swung for ten, but on the following turn when I was going to finish him off he topdeck’d AEtherize to take me down. I had a few turns to draw burn, but sadly didn’t get it in time and he was able to gain life with Primeval Bounty to get out of range and then crush me with some creatures that had a zillion +1/+1 counters on them. The deck was quite scary, and it looks like once the list goes online for the masses that it will become a thing. If it doesn’t I might even consider playing it for fun, because it really felt like we were playing Commander and not Standard. I’ve enjoyed a lot of success recently and I am really thankful for all the support and comments from the community and my readers. I’ve played magic now for over 19 years off and on; basically since I was a little kid. There’s been many times when I’ve been frustrated with the game, whether it be the cost of playing, lack of tournament success, time involvement, the quality of cards, and various other reasons. But overall, Magic is awesome, and it really has been such a great part of my life. I’m always blown away at how the R&D at Wizards is able to raise the level of play with each set and recreate the passion in players that they first had when they first saw the game. Theros was a perfect example; just when I thought there was nothing they could do to top a great block like Return to Ravnica, they come out with a set that is just amazing. The sealed is fun, there’s dozens and dozens of cards I like playing with in Constructed, and it makes me want to continue to try hard every day at making the Pro Tour. We truly are a lucky bunch who play this game. The main message I want to send today is to have confidence. A lot of the struggle of this game is the hardship of putting in a ton of investment and then not breaking through. I can tell you firsthand that I’ve had so many top 32s, top 16s, long weekends with terrible social interactions, and a million other factors that have made me want to throw my hands up in the air and never come back. But the “practice makes perfect” phrase really rings true with Magic. Keep playing, and don’t think that if you don’t practice as much as the guys who are actually on the Pro Tour that you don’t have a shot. A lot of close friends of mine have said things like “we’re not as good and we can’t make it because we don’t practice as much as them”. Or they’ll get discouraged after a few rounds and then mentally give up. They’ll start making illogical observations, or jumping to conclusions instead of trusting their gut. And it’s not just friends, I’ve done it plenty too. I started getting better when I started believing. It took a top 8 at a small tournament months ago to truly put the fire back in me for this game, but after that tournament it made me realize that I was always capable of better success and I know going forward that my higher goals can be achieved if I work hard at it. We all have jobs and real life obligations to deal with, but if you come to every tournament with one sole focus; winning it, and you do not waver from that focus, you will put yourself miles ahead of the other person who doesn’t believe. This might sound like pyscho-babble, but it seriously is the truth in my opinion. I know that I have made mistakes, coughed up games, and played poorly on account of my attitude or a mental lapse. That doesn’t mean that I haven’t lost games due to mana screw, mana flood, or variance, but when you eliminate some of that by really restructuring your thought process going into a tournament, your win percentage will eventually go up. Like anything in life, it’s an everyday struggle and you have to keep truckin’. What a weekend for the Mono Red archetype. As with every new format, Mono Red is always a deck that’s looked to because people are experimenting and with an unknown Meta there’s something to be said for consistency and a deck that punishes stumbling. That said, I was pleasantly surprised to watch Owen Turtenwald and Philip Bertorelli smash their way to top 8 and then see Philip take the crown. Theros has a lot of hostile cards against the archetype, and our favorite creature, Hellrider, has left the party. In testing leading up to the release, I was having a lot of trouble finding a list that I liked, but I think the presence of these two finishes brings plenty of discussions points to the fold and forces opposing decks to make different build choices that could be beneficial for the Red Deck. Today I’m going to cover my thoughts on the tournament itself, and then get into some of the lists and what I think about the future. Before we get started, if you haven’t checked it already I’d look at the decklist results for the top 32 HERE. Three clear archetypes dominated this tournament; Mono Red, UW/x Control, and G/R/x Midrange. Throw some W/R Aggro, G/W Aggro, Big R/W, and B/R/x Midrange in the mix and you have the mostly completed picture. What’s interesting for Mono Red though is that I think it gained a significant advantage in this tournament by the way it ultimately played out. Prior to SCG Worcester, if you had to guess at what would be big in the metagame, I think that these archetypes would be high on the list because of what’s been wrote about recently on Starcity, TCG, and Channel Fireball. But what’s surprising is that I really thought that Midrange would play a bigger role here. 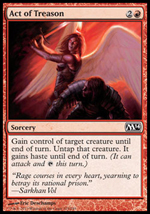 Sure, Mono Red was expected, yet anyone who did some serious testing knows that Anger of the Gods is really good against it and that it has trouble beating high amounts of removal backed up by creatures that end the game quickly. 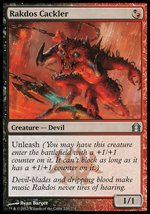 It also has a very big problem with cards like Obzedat, Blood Baron (to an extent), and Warleader’s Helix. Yet ultimately, the only Midrange decks to make the top 8 were Naya and GR. I believe a big reason for this was the strong presence of control, specifically Esper and UW. If you don’t play the cards in your Midrange decks that make these grindy games tougher on Control, the matchup can go the other way quickly. Blue has access to some very good cards right now, and whether you combine it with white, black, or both, the supplementation can mean that you get a firmer grip on the game than you could prior to rotation. For starters, you really need Thoughtseize somewhere in your 75 if you’re going to even start battling against Control, and you also need to be able to shift your deck into a faster clock. The former is very important because blue decks are currently playing more countermagic than they were before (since Cavern has rotated) allowing them to dictate the tempo of the first five to six turns which ultimately leads them into their late game which is usually better than yours. The latter is important because the better Control and Midrange decks have cards that are virtually unanswerable in Aetherling, Obzedat, and to a lesser extent Elspeth and Blood Baron. I really liked my Big Red decks in testing, but one of the major problems I ran into was that if the opponent just countered a few of my three/four drops (typically the first things played), they could then get out a few cards that I had no way to beat aside from some narrow answers that were must draws. 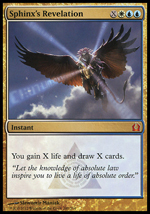 If you then segway that into people who were playing G/W and R/W, you see lists that are so streamlined that they will get into trouble as soon as they are trumped by a particular card. 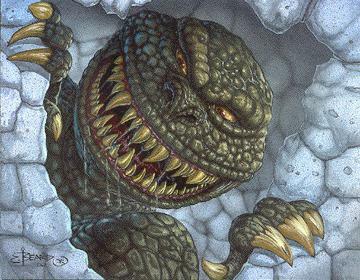 G/W probably presents the most threats of any deck in the new meta, by attacking through different angles in Advent of the Wurm, a swath of troublesome aggro creatures, and Brave the Elements, but it folds to Supreme Verdict. As soon as you get Verdict’d, and especially if they have an Azorious Charm or Far/Away before then, you are so far behind. The GW deck doesn’t have anything late game to “reach” through the opposing defense like the burn in Mono Red (and Fanatic of Mogis). That’s one advantage also to the Naya and GR decks, they play a little bit of burn and the planeswalkers here are overall very threatening (Domri and Chandra). G/R also presents finishers that are incredibly tough to kill or present an evasive clock for the Control opponent. Ember Swallower’s Monstrosity trigger is virtually game over when resolved, and his P/T ratio allows him to dodge popular removal spells across the Meta. Stormbreath Dragon’s protection from white protects it from Azorius Charm and Detention Sphere, which are two of the main ways other than a Supreme Verdict that the Control player would use to stop them. So if G/R and Naya have so many weapons against control and have very grindy cards against aggro (not to mention removal), how’d they lose? The answer lies mostly in the top 8. In round one, the Naya and GR player were paired against each other. The GR player won (I didn’t catch the stream so I don’t know what happened but both lists are similar), and then from what I heard from a close Mono-Red-Playing-Friend, Bertorelli defeated the GR player on the back of a critical mistake involving Anger of the Gods. Like all matchups with Mono Red, it can go either way, and especially with Bertorelli’s build he’s never truly out of a game. That said, GR should be the favorite most of the time against most Mono Red builds as its creatures outclass many of the aggro critters, it has burn, it can ramp if unchecked, it has lifegain, and Chandra’s Phoenix is clunky against it. Max Tietze’s UW Control deck was well positioned against Owen’s Mono Red build and that showed in the two losses that he gave to Owen (one in the Swiss, and one in the top 8). Bertorelli’s build however was a lot better equipped to deal with UW, although we didn’t get to see that really play out in the Finals as Tietze got color-screwed and couldn’t play half of his cards. Still, you could see if you watched the match why Bertorelli’s build would be better than Owen’s in that matchup; he still presented a clock, he had bigger threats than Owen’s list that weren’t so fragile, he had scry digging power for cards he needed with Magma Jet, and his sideboard had both Hammer and Chandra unlike just the pairs of Hammer and a Skullcrack in Owen’s board. Chandra is a fantastic play against UW both as a followup to Supreme Verdict or as a supplement to your army so that you can redirect their attention and removal. It’s also great at preventing UW’s usual one or two blockers from getting in the way (especially in combination with Firefist Striker). 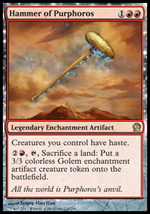 Hammer’s not bad either, endless Golems and giving your entire deck haste is always a big deal against Control, but with UW being such a difficult matchup at times it’s nice to have a few extra singletons to bolster it. Ultimately though this takes us in to a deeper discussion on the two builds. Both of them are good, both of them are similar to ones I’ve tested thoroughly, and both have changes that could be made to bolster them for the future. This configuration of one drops declares an obvious point about the direction you want your Mono Red deck to play in. The presence of twelve one drop creatures and Foundry Street Denizen specifically means that you are just going for the sheer speed and power approach. Legion Loyalist is sometimes seen in blitzier versions, and overall his utility is better, but if you just want efficiency and power to kill your opponent as quickly as possible, Denizen is the right choice. The major pitfalls of going in this direction are fairly obvious; your creatures are outclassed immediately, they’re easily killed, and you dilute your ability to have any kind of mid to late game activity outside of a few cards or some sideboard singletons. The advantage you gain is that if you are a good player you can carefully construct your attack in the first few turns to dodge a lot of bad matchups and bad cards. Give this build to an inexperienced player, and the mistake or two they make will easily cost them the game in many situations. But in the hands of someone like Owen, this is a threatening deck. It’s a choice that I’m not surprised he chose, mostly because playing a build like this also gives you the opportunity to free-roll wins in an immature format. Decks that either aren’t prepared for Mono Red or that simply made too many deckbuilding concessions and decided to miserly address the archetype will absolutely get punished by the consistency and raw speed of this build. And decks/pilots that actually did bring something to the fold against this style have to draw their key cards and play tight in order to win. The free roll factor is even at play there, and it was evident in the second game of Owen’s swiss match against Max Tietze where he just overwhelmed the UW deck before it could get online. The biggest drawbacks though to this style are that sweepers are absolutely devastating and you have very little play in the late game. Still, to have an explosive game 1 and possibly secure being on the play if a game 3 arises is a very big deal. Shock is important in this build because again you are going for efficiency and power. It’s also extremely relevant that you clear anything that slows down your clock off the board, and usually even just being able to kill one of their blockers is enough in conjunction with how many bodies you can put down and Firefist Striker’s battalion. And while it only does two damage, most of your creatures are two power on their own, so you can still take down 4/4’s like Loxodon Smiter. You might be two-for-one’ing yourself in the process, but if they’re dead that turn or the next because of it that consideration doesn’t end up mattering. Against opposing aggro decks, being on the play and being able to out-tempo them if you aren’t is another big reason why having a one mana burn spell is critical. This is all of course not even addressing the need for reach, which can be valuable in some games where a Verdict or Anger comes down when they are at a low life total. Mutavault is essentially another one drop here too, as this build is not concerned with casting a Boros Reckoner on time or worried if it stumbles on mana mid game. Mutavault is just another body and a great weapon against the sweepers that disable this deck. It turns on Firefist Striker’s battalion very easily, and in the builds I’ve tested like this it’s a critical card to include. You might be surprised that Owen is running twenty-two lands, but running any less with four Mutavaults can give your deck a lot of variance draws and Vault essentially prevents you from flooding too hard since you’ll always be able to do something with him. Furthermore, given that he needs an instant speed spell most of the time to kill him, you can really stretch your opponents removal or even not worry about it at all if their list isn’t properly prepared. Continuing the theme of power and efficiency, Owen chose to go with the highest power and value in his two drops that he could. He’s playing the full playset of Gore-House Chainwalkers, which although not hasty bring enough beef to the table to trade with a lot of creatures better than itself. I really like how he basically ran six Firefist Strikers by including the two Shortcutters. It’s easily the worst two drop of the bunch, but in a suicide aggro mission like this build, it makes a lot of sense and probably gave him a ton of game wins. You’re also just going to have those nut draws where you have an active Firefist Striker followed by a Shortcutter which probably gets you a turn 3 or 4 win. 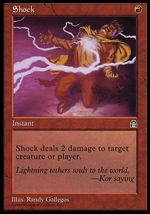 His choice to run four Lightning Strike is mostly needed to supplement Shock for the very purposes already discussed. 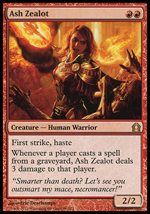 The notable absence is Ash Zealot, but in a build like this you’re basically going for the Burning-Tree draw, so maxing out on two-drops that can be played off the Tree is typically the smart choice. Zealot is also one more card that makes the Mutavault mana difficult, so I’ve found that this needs to be a conscious factor in your building choices. Three is a perfectly fine place to top off your curve with this build, and Chandra’s Phoenix is the only card that makes sense here in game 1. It’s the fastest three drop and it’s evasive, along with enough burn to occasionally get some buyback value on it. Owen’s list is such a straight port from the old RTR lists (aside from Phoenix) that there most likely was no real reason to go bigger on it. He really wasn’t trying to beat the mirror, he was just trying to have a fast game 1 (because a lot of times game 1 in the mirror is a coin flip anyways) and get as many free-roll wins as possible against the rest of the field. The sideboard here is pretty simple and about what I would expect for the Blitzy build that Owen was playing. Note that there aren’t any four-ofs here, although there are some cross-matchup spells. The Blitzy version of Mono Red is really hard to cut cards from, and that’s a big reason for not just jamming a lot of one card. 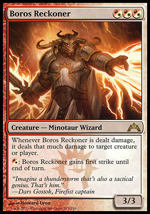 Boros Reckoner and Flames of the Firebrand give him six more cards to control the mirror match, and if he really wants to he can dip into Mortars and Peak Eruption, although Mortars is more for the Midrange matchups and Eruption more for the Big Red and R/W decks. Still, he can pseudo-morph his red deck into more of a Big Red build if he feels like it with this availability of spells. Cutting one drops is a fairly reasonable thing to do for these spells, since they are often disposable to your opponents burn and get outclassed quickly. 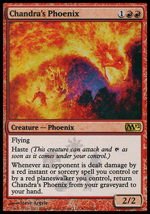 Phoenix can get cut for Reckoner, or if you do the big route you can keep him in for his buyback and evasive abilities. 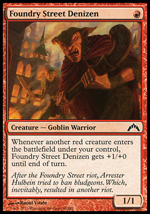 -4 Foundry Street Denizen and -4 Firedrinker are the pretty obvious first cuts. Act of Treason and Skullcrack are perfectly fine in miser roles like he has them here. The main sixty cards is already so fast that you can overrun a lot of decks that plan to put big creatures in front of you, and with no Thragtusk in the format a lot of these creatures just end up getting Firefist Striker’d anyway. Still, it’s helpful to have another card or two against decks that have things like Desecration Demon, Ember Swallower, or Blood Baron, so it plays it’s role. 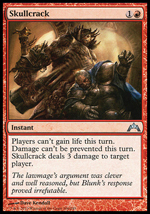 Skullcrack is often jammed as a four-of, but it’s really a fairly awful card late game against anything but Control, and it’s NOT the card you want against Midrange even if they have lifegain. For starters, there is again no Thragtusk in this format anymore, and even if he were there, you need to fight Midrange decks with board presence and removal, not three to the dome that leaves you down a card. Against Control though, drawing Skullcrack later in the game to prevent multiple Sphinx’s Revelations, or drawing it early and preventing the first, can be very good. It also gives you more reach, kills planeswalkers, and is more efficient than Shock against them. 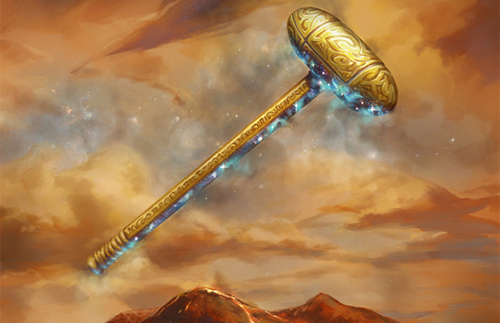 Hammer of Purphoros is a pretty sweet card. I started testing it a few weeks ago after suggestions from readers, and I’ve really come to like it. It’s not something you want against aggro, and a lot of your creatures already have haste (although not as many in Owen’s build), but against control it is one of the best cards right now to have access to. I would never run more than two of them, due to its legendary status, its limited useability beyond flooding, and the fact that its first ability does nothing in numbers. It’s really rare that you’d be able to activate two at a time, and you wouldn’t get any activations beyond the first if that were the case let alone that situation being in a game that should have been won or lost already. 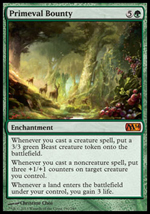 But as a two-of, it’s a very nice supplement to your creatures and another threat that gets around Supreme Verdict. Just Cackler and Shock here. The SCG commentators were talking about this, and they theorized that Philip just couldn’t get Firedrinker Satyr in time. They kept commenting on how this was his first big tournament outside of an FNM and with the set being new and him being inexperienced that it was the most plausible thing they could think of. With the price and configuration of the rest of the deck, I’m guessing this wasn’t the case. 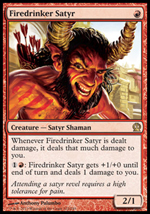 Firedrinker was $1.50 this week at my store, and while his availability was limited (I still don’t have my playset), they almost always have enough of popular cards at an SCG event to not run into issues like this. I believe this choice was a conscious one of Philip’s, because clearly he’s playing a bulked up version of Mono Red designed with beating the mirror and having a more resilient “flexible” game against Control. Not running Firedrinker means you’re not taking that extra few points of damage in the mirror for having a Jackal Pup that can also get burned and dome you. It also means you can devote more cards towards Burning-Tree, you can run both the premiere three-drops in Mono Red which are good almost across the field, and you can run more burn, which dictates the mirror as well. These choices to me were obvious, as I was running a similar pre-rotation build, but then I looked at the top 8 profiles and even there Philip said that the decks he expected were the Mirror and Control. The one area this hurts you in is against Midrange, because you’ve slowed down your clock significantly, and even against Control it can sometimes backfire. The nice thing about the rotation though, was that you’re not giving them more time to play Thragtusks, so as long as you can handle the other threats they play, you can still be in comfortable shape when they get some of their bigger stuff online. And don’t get me wrong, this deck is not slow by any means. It’s still Mono Red Aggro, not Big Red, and not Midrange Red. You have a one drop, you have many two-drops, and it can still curve out very easily. 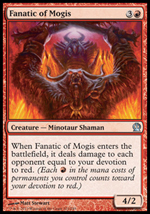 Topping out with Fanatic of Mogis and more resilient creatures can help you pull off some early wins, especially if your opponent is playing a removal-light deck. There are two considerations going on here. Unlike Owen’s list which just ops for efficiency, Philip goes for card value by playing the full playset of Magma Jet and Ash Zealot. The scry on Magma Jet is just absolutely insane. This card was a staple in Magic years ago, and it’s going to be again. 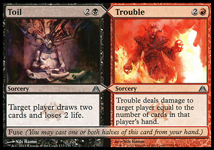 No deck wants the ability to orchestrate their draws more than a Mono Red Aggro deck that frequently runs out of gas and just needs a few last damage points to “close the deal”. Even in Owen’s Blitz version, I’m a bit surprised he didn’t try to find room for it, but I understand from a power standpoint why he probably dismissed it. Burning-Tree Emissary and Firefist Striker are there to give this build the ability to still “nut draw” and provide faster starts in general. Firefist Striker over the past year or so has proven itself to be a huge roleplayer in Mono Red, and with the absence of Pyreheart Wolf and the clutter at the three-drop spot already, it makes perfect sense to play him at 2cc as he’s usually what you want over the other options available. The one-of Gore-House Chainwalker is a mistake in my opinion. I think Philip just wanted another Burning-Tree target and something with a little power, but I really really don’t like how his list only runs 21 lands, none of which are Mutavault. There’s just no reason to have a miser of that card, and no reason to not run a Mutavault or two, even in a deck that needs to have double-red a lot. One other thing I know from playing Mono Red for years now is that 22 lands is the sweet spot if you have four or more four drops, and in the case of Philip’s build, the eight three drop creatures he runs adds an even bigger reason to make this move. There’s so many games with 21 lands that you’ll get stuck on two, and maybe a stats guy will argue, but I’ve played thousands of games with 20, 21, 22, 23, you name it, and 22 is that nice place you want to be with a list like this. In the list I played pre-rotation that had a very similar configuration, I played 19 Mountain and 4 Mutavault, and the mana was good. You don’t need to play Reckoner on turn 3, you just need to make sure you’re doing something, and with that many Vaults and the amount of threats in general that you’re running, you will indeed be doing something. It also helps when you move to the sideboard, especially if you’re not adding in extra land out of the board like in the case of Phillip. When he boards against UW Control, he’s bringing in a Hammer and two Chandras, which ups his curve even more on that fragile 21 lands. Granted, you’re playing a long game at times against them and may have more time to draw out of land screw, but part of your advantage against them as a deck is to apply a clock. I’ve already covered these guys quite a bit, but basically this is an aggro list that is borrowing the best two elements from Big Red. These three drops are great against the field, and often just better than anything else you could be doing. I like him having access to both. When this card was spoiled, I did a barrel roll. Then I tested online with it a lot, and I wasn’t super happy with it because there’s so many decks that have turns 2/3 removal followed up by a sweeper, at which point he becomes very underwhelming. I also missed Hellrider, who was clearly one of the best four drops ever. But this list is a dead perfect fit for Fanatic. For starters, you have plenty of devotion and are going to get those games where he comes down on turn four and just decimates the opponent. And in games where your opponent does have some early removal or sweepers, it doesn’t really matter because you’re playing the long game anyway, so you’ll probably have a point later in the game where he’s just as effective and threatening. And if you’re playing the long game, you don’t mind having a four power guy regardless of the situation. This is a great list for him, and the sideboard only makes him better. Purphoros is a card that I’ve tested extremely heavily, but ultimately he does not have enough of an initial impact on the board and is too reliant on other cards to perform. He will absolutely see play, and he is a good card despite some of the limitations, but he’s not an automatic inclusion. It’s a possibility that “card availability” could have been an issue for Philip’s choice of not playing him, but it’s doubtful. In a list like this, I want to be pro-active, and Fanatic + Chandra do that the best. It also doesn’t help that much like Vexing Devil, Purphoros gives your opponent the ability to decide what happens by controlling your level of devotion. What could be interesting is if a lot of Mono Red lists suddenly switch to him; this might be a nice metagame call to throw off whatever sideboard hate is being brought in this week. Philip’s sideboard is all about the K.I.S.S. philosophy. Keep It Simple Stupid. He’s playing a lot of four ofs and a few singletons because he knows what he wants to beat and knows that most of his sixty is great against everything. Starting with Frostburn Weird, we have a great anti-mirror and anti-aggro card. I’ve played with Weird a lot in the past, and then a lot more recently in testing for Theros. Typically in the mirror I like having more burn, but against a variety of aggro decks I like Weird as well. The biggest reason to run him here is his count towards devotion, so I have absolutely no problem with Philip’s maxing out of him. Philip already chose a maindeck that has clear motives of beating the mirror, and this is the dagger. And don’t ever let him have an empty board, because this little 1/4 suddenly takes over games. I’ve railed on Burning Earth in many of my recent articles because of how much the old metagame adapted to it, and while that’s still true with the rise of UW control, the top 8 was perfect evidence that people still just don’t get it. Multiple Esper Control decks were present, which is the best case scenario for Burning Earth to shine. One of my teammates is a religious Esper player, and Burning Earth is easily the #1 card he hates seeing. I mean, you just can’t play with that card out. There’s so many situations where the game is over when this comes down, and it’s an amazing followup to a Supreme Verdict when your opponent is tapped out. Still, four is WAY too many right now, and while I know Philip wanted to make sure he drew it and expected a lot of control, I’d just rather have a 3/3 split with Chandra (who is much better against UW and other matchups) or another Hammer, or something else I need for other non-control matchups. There’s also the situations where you’re behind on the board, and in those situations having Burning Earth in hand is essentially the same as having a dead card. 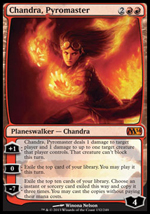 I’ve already discussed the Hammer, so I’ll move on to one of the best sideboard cards he decided to run; Chandra, Pyromaster. Chandra has so much going on, and she’s so new that I think a lot of players don’t quite understand her. I’ve played her into the ground now, so I really think I have a firm grip on how you need to go about business with her. For starters, she’s not an auto Hellrider replacement, but at the same time she needs to be in the 75. Most people think her 0 ability is her best one, but that’s largely dependent on the deck and the format. In Legacy, it is the best ability without question. But in Standard, her +1 is fantastic. Think about all the implications; kill an aggro creature repeatedly while at the same time putting her at an enormous loyalty that demands attention less they want to be domed for 9, make a creature not block which is the extasies against every archetype, lock down planeswalkers from reaching their ultimate, or simply Curse of the Pierced Heart your opponent to death. She’s bananas. 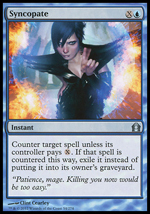 And at basically five starting loyalty, she’s also really hard to kill unless your opponent is playing Midrange. And therein lies her weakness. Unless you yourself are playing a Midrange deck and can properly defend her, she’s usually a bad card for Mono Red in that matchup. This is the big reason why she might not always make your sixty, along with the fact that she’s a little slow against aggro. There are games against aggro, mostly games 2 and 3, where you have a lot of removal and then she just comes down and dominates, but you can’t guarantee those situations, especially in game 1 where your build may or may not be supportive of her. Lastly, her mana cost is yet another supportive card towards devotion, which adds to the list of reasons for why you should have her in your 75. 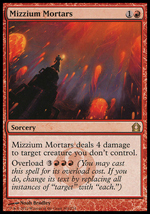 Mizzium Mortars as a four-of is something that should have been a lock for Mono Red players in this tournament. While Midrange didn’t show up much in the top 8, it was present in good numbers throughout the top 32 and some of these new Theros builds are truly nasty. Blood Baron, Stormbreath Dragon, Loxodon Smiter, Kalonian Hydra, you name it, are all extremely challenging to deal with in Mono Red. You let one of these guys sit on the table for more than a turn and you will be the one they start calling Deadguy Red. Plus, it’s never a huge nonbo to run four of them, because you can bring them in against any of the aggro decks if you want (or some of them) to supplement your existing burn suite. And while Philip’s build probably won’t overload very often, it does still happen at times with 21 lands. And we all know what a one sided wrath feels like. . .